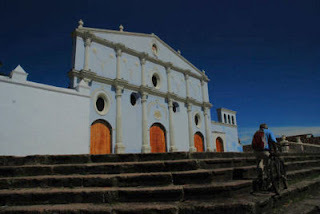 The San Francisco Convent Cathedral complex in Granada, Nicaragua is another example of Nicaraguan ingenuity. The buildings cover a square block and consist of the old convent that is now a museum, and the old and new cathedral. I went to a wedding in the cathedral last week. Fairy tale stuff with huge ceilings and ornate works of art. That's besides the plexiglass covered skeletons of some bygone church people that are on either side of the altar. I'll leave the tongue in cheek jokes up to the reader. The place is so huge, bats have made it a permanent cave, and no one seems to mind in the least when they swoop through various religious ceremonies looking for a bug snack. Certainly makes sitting through some of the longer ceremonies an enjoyable study in animal behavior. San Francisco Cathedral is unique in that it has a main entrance facade and a smaller rebuilt cathedral behind that. And here is where San Francisco becomes one of my favorite Cathedrals in Granada. The rumor of the tunnel is not-so-rumor here. I have spoken to people that live across the street that have seen this tunnel, and have themselves unearthed artifacts on their properties. Short of going from door to door with a pix ax over my shoulder and asking to see their basements, I still have some more hunting to do before I can see this tunnel for myself. Or the artifacts from it. The presence of skeletons in underground vaults in San Francisco is not lost on me here. Oh i am so pleased that you dropped in. I had forgotten just how very lovely it is here. The Cathedrals are simply beautiful. I loooove cathedral photos and hope you find your secret tunnel. :D What a great blog. I'm thankful you posted on mine so I could make a visit. I'll be back!!! Your cathedrals are beautiful - I especially like the Nov 25 post - you composed the shot perfectly! I went there a few years ago (Mexico to Brazil, by bus... of course!) and loved Nicaragua. It was really hot though... especially in Omotepe and in Managua. These are great photos! Thanks for adding me in BlogCatalog, I am also subscribing to your blog with my RSS reader. I love the photos of places here. Thanks for sharing.